Donald Torr grew up obsessed with Dusty Springfield, ran off to London to attend drama school at 15, worked as a dancer, released some singles and, finally, made his millions in antiques and property. With such a life, no wonder his sister Diane is in awe of him. She shows video clips, eagerly pointing him out on screen as he appears briefly in music videos and graces the cover of Jackie, but the audience are not let into much detail about Donald. We know what he does, but not who he is, which keeps us at arms' length, perhaps what Diane wants in order to preserve her reverent image of him. Alternately Diane, Donald, or Donald doing Dusty in drag, Torr is gentle and graceful, using the stage carefully – why use two steps when you could use eight and give the audience space to think? At times we are just that – an audience, at times we are all the collective Diane, at times detached and at times invited in to dance on stage or to send a message to lost loved ones. This disparity breaks up what could be a smoothly-running performance if there weren't so many different parts. There's stand-up comedy, film clips, an extended sequence where a shoe is passed around, lip synching to a full song: Torr has so much to say and not enough focus. 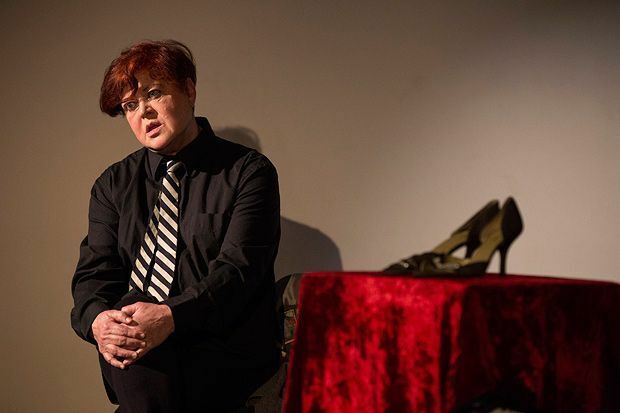 Torr is Scotland's foremost drag king, but here she indulges her glamourous side, and Diane playing Donald playing Dusty is a thought-provoking exploration of gender that has its heart firmly in the right place. Summerhall, 560 1581, until 30 Aug (not 25), 7.35pm, £12 (£8).